Bose is no longer the king of active noise cancellation. We said last year that Sony had put Bose “on notice” when it comes to active noise-cancelling headphones. Our review of Sony’s WH-1000XM2 reported that Sony not only delivered incredible audio quality, but that the company offered some high-tech features Bose couldn’t match. This year, Sony fully eclipses Bose with its third-generation noise-cancelling cans: The WH-1000XM3. These headphones are superior to the Bose QuietComfort 35 II in almost every way. 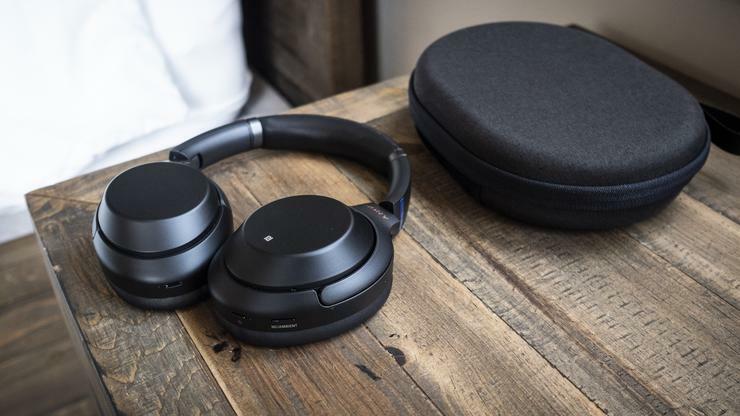 Sony retained all the features that we liked in the previous iteration, including adaptive sound control, gesture recognition, and great audio reproduction (at least when powered), and made significant improvements to its active noise-cancellation technology. Sony’s new headphones are also more comfortable to wear for long listening sessions. 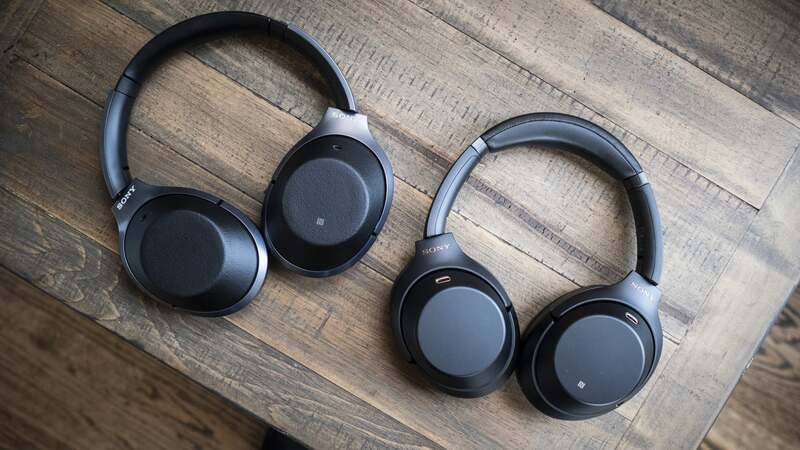 The Bose QC35 II (left) are top of mind when it comes to active noise-cancelling headphones, but Sony’s WH-1000XM3 are better in every category that matters. First up is the gesture control pad located on the right-hand cup. After a brief learning curve, I grew accustomed to controlling my music and podcasts with simple swipes. Swiping up and down with your fingertip raises and lowers volume, while back-to-front and front-to-back strokes move up and down your playlist respectively. Holding your finger down for a few seconds activates Google Assistant on Android devices, or Siri for iOS hardware. This worked flawlessly, though I do wish the virtual assistant appeared more quickly after being summoned. Perhaps Sony can add a preference setting to its app. Sony’s Adaptive Sound Control is something special. When this mode is selected, the headphones monitor your level of activity and automatically choose the appropriate noise-cancelling profile. You can also customize these profiles using Sony’s excellent Headphone Connect app. Inside the Adaptive Sound Control section of Sony’s app. If I’ve been sitting still for a bit, for example, the Staying profile will kick in with a short notification chime. This one uses the headphone’s onboard microphones to monitor ambient sound, so those noises can be cancelled out, while allowing the sound of human voices to come through. 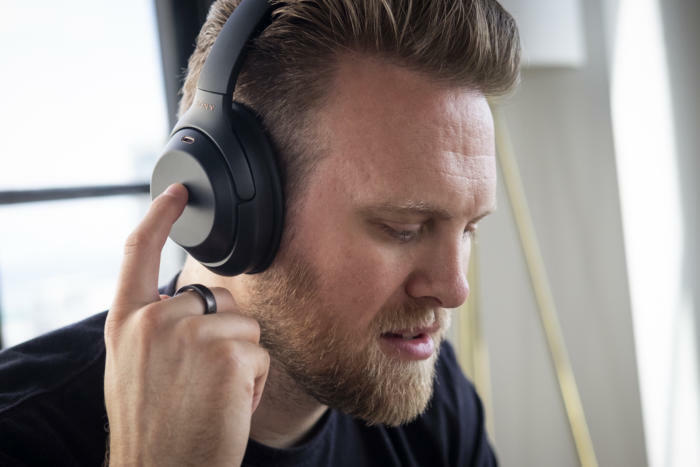 You get a personalized mix of your music and the sound of the outside world, with 20 levels of noise cancellation available. The Bose QC35 II offer just three stages of cancellation, so there’s no way to fine-tune the mix of music and ambient sound. When I listen to music while walking home after work, I want to hear the environment around me, so I don’t get run over by a cranky San Francisco driver. I quickly learned that I couldn’t do that with Bose QC35 II. No matter which settings I applied, I couldn’t hear enough of what was going on. Sony’s headphones not only delivered a great listening experience—even at low volume—but I was always able to maintain situational awareness. The Sony WH-1000XM3’s fit nice and neat in their travel case. 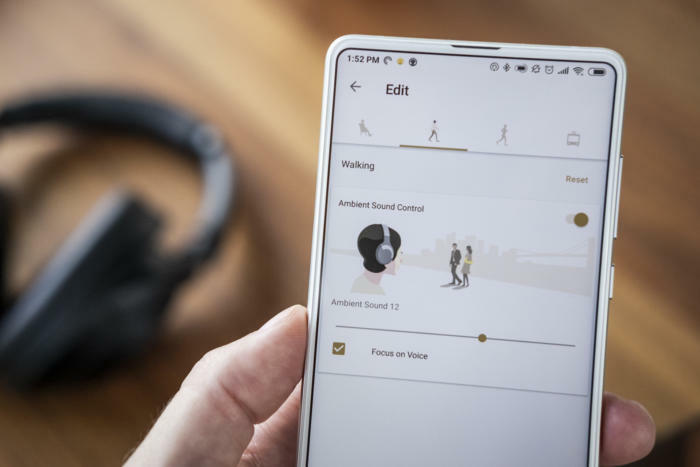 In conditions where it’s inconvenient to launch Sony’s app, you can control the headphones’ active noise cancellation using the NC/Ambient button on the left-hand ear cup. This limits you, however, to three values: Fully engaged (the strongest level of active noise cancellation), fully open (the least amount of active noise cancellation, with the mics piping ambient noise into the ear cups), or active noise cancellation turned off (in which case, the headphones behave as conventional Bluetooth headphones). Sony’s WH-1000XM3 have a 3.5mm analog input, an on/off button, and an noise-cancellation/ambient sound toggle on the left-hand ear cup. There’s a USB-C charging port on the right-hand cup. Audio performance hasn’t changed much compared to last year’s model, but that’s not necessarily a bad thing. In a head-to-head comparison with the Bose QC35 II, I found Sony’s WH-1000XM3 to be slightly more musical. 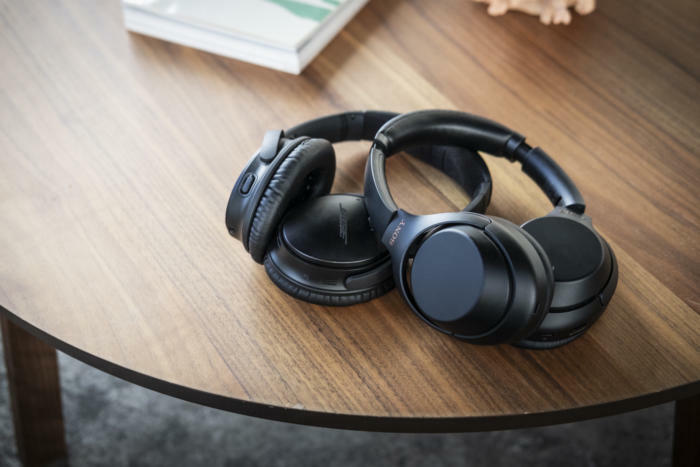 Sony’s headphones maintain a more accurate frequency response across the full spectrum, where Bose seems to favor a scooped EQ that emphasizes bass and high frequencies at the expense of the mid-range. Sony’s cans never muddied the mid-range even while playing bass-heavy tracks at high volume levels, although I did notice some very minor distortion in the upper frequency range when I really cranked the volume. Sony’s WH-1000XM3 are much more comfortable than its previous generation headphones. I noted this during my briefing last month; it’s one of the biggest improvements over last year’s model. 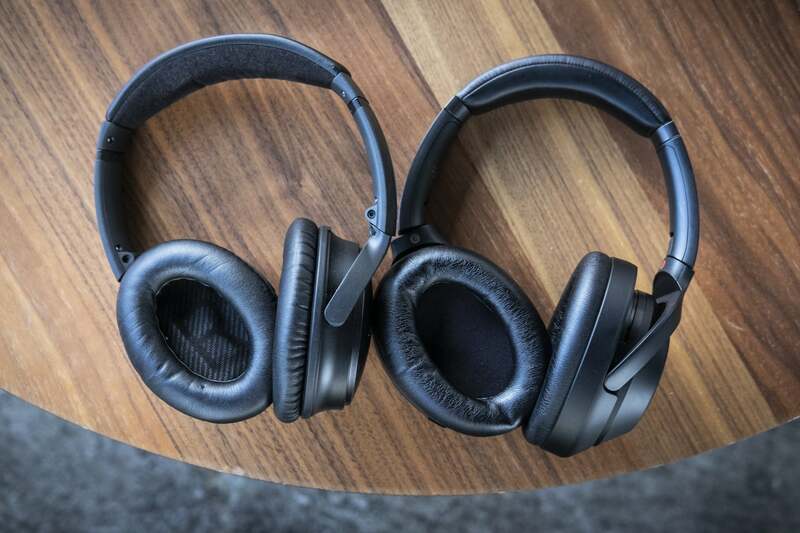 The WH-1000XM3’s (right) are larger than the Bose QC35 II, but that allows for more space and padding around the ears. Sony added extra padding to the bottom of the headband to distribute the weight on the top of your head more evenly. The ear cups are also wider and deeper, which reduces the pressure placed on the sides of your head and allows you to wear them for longer listening sessions without feeling fatigued. As such, wearability is another clear win against Bose’s product. Sony knocked it out of the park on this count. The wider ear cups, compared to last year’s model (left), might seem like a minor tweak, but you’ll notice the change immediately. Sony also made improvements under the hood, including the addition of a new custom integrated circuit called the HD Noise Cancelling Processor QN1. This new processor separates the headphones’ DAC (digital-to-analog converter) from its digital amplifier to present a cleaner signal path. There’s also a new USB-C quick-charge feature that promises five hours of wireless playback after a just 10-minute charge—a claim I need to test further. I can tell you that I’ve been able to use these headphones for weeks at a time without needing to charge them. The textured finish on last years model (left) looks rather silly compared to the sleek finish from this years. The last improvement to note about the WH-1000XM3 is the design. While it’s not a major improvement over the WH-1000XM2, it has been further refined. The plastic shell is now smooth, especially compared to last years rough finish. Sony has also added gold accents to the small microphone openings on each side and to the logos on the band, which is a nice touch. As it stands, I recommend the WH-1000XM3’s to anyone looking for premium noise-cancelling headphones. 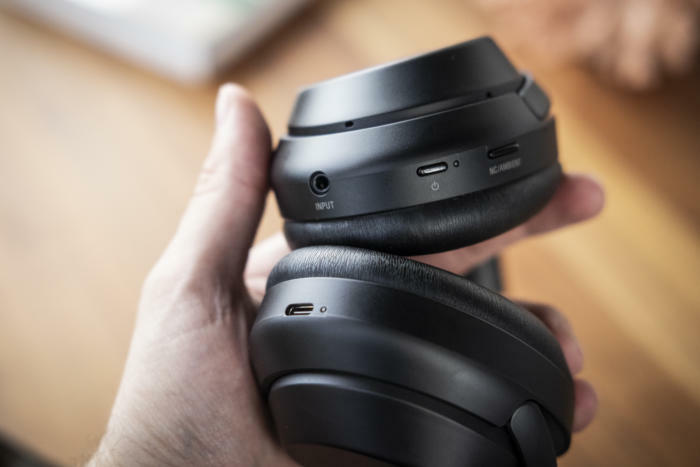 These are not only an improvement over last year’s already great cans, they’re better than the previous gold standard: the Bose QuietComfort 35 II. 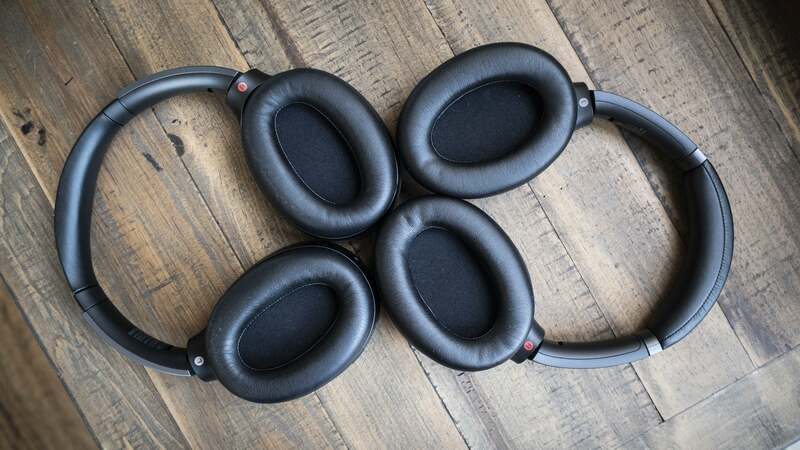 The 1000XM3 are more comfortable, with deeper and wider ear pads, they offer a more robust collection of noise-cancelling options, and they sound—and feel—more refined in almost every way.